Listen to Dr. Jennie Connor, Chair in Preventive and Social Medicine at the University of Otago Medical School in Dunedin, New Zealand. 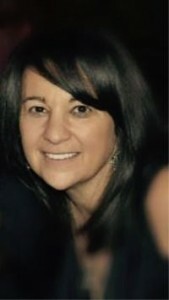 She is a public health physician and epidemiologist, involved in teaching epidemiology, and in research about the health effects of alcohol, injury prevention, and sexual health. She has led two New Zealand studies on the health burden of alcohol in New Zealand, in collaboration with the Global Burden of Disease alcohol group, and is an advocate for evidence-based alcohol policy. Cancer is thought to be only 8%-10% genetic. The remainder is thought to be exposures to mutagens in our lives. There are always exposures we are unaware of, however, there are numerous exposures that are within our control. The evidence of a causal role of alcohol in cancer is unfortunately smothered by the once thought protective effects of alcohol on cardiovascular disease. 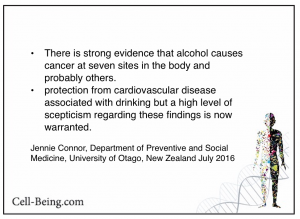 The same, or similar, epidemiological studies also commonly report protection from cardiovascular disease associated with drinking but a high level of scepticism regarding these findings is now warranted. And….I think its fair to say, most people do not want to accept the thought of alcohol causes cancer, and would much prefer to think of it having protective effects against CVD. Denial is a psychological defense mechanism that helps a person avoid a potentially distressing truth. This is about choices. Our bodies are regularly bombarded daily by mutagens, toxins, carcinogens, viruses and bacteria. Some of these we are aware of their risk, many are being studied, and some we are completely unaware of their potential health burden. It is our duty to be active participants in our health management. Please make choices based on current scientific data. Oxidative Stress: Another byproduct of ethanol metabolism – free radicals- reactive oxygen species, which can damage DNA, proteins, and lipids (fats) through oxidation. Alcoholic beverages may also contain a variety of carcinogenic contaminants that are introduced during fermentation and production, such as nitrosamines, asbestos fibers, phenols, and hydrocarbons. University of Washington study tested 65 wines from America’s top four wine-producing states — California, Washington, New York and Oregon — found all but one have arsenic levels that exceed what’s allowed in drinking water. Reported in JAMA (Journal of the American Medical Association: “findings from the Nurses’ Health Study exploring the relationship between alcohol consumption and breast cancer risk. The authors’ principal findings were that the cumulative amount of alcohol a woman consumes during adulthood is the best predictor of her breast cancer risk and that low levels of alcohol consumption (as few as 3 drinks a week) are associated with an increased risk of breast cancer. ” Author Dr. Steven Narod, referred to alcohol as a “third breast carcinogen.” Alcohol followed on his short list only after ionizing radiation and hormone therapy. I believe that avoiding packaged foods may be the first step for you to lose weight. They may taste fine, but prepared foods currently have very little vitamins and minerals, making you consume more only to have enough vitality to get throughout the day. When you are constantly eating these foods, changing to grain and other complex carbohydrates will help you have more vigor while ingesting less. Great blog post. Good post. I learn something new and challenging on websites I stumbleupon everyday. It’s always helpful to read through content from other writers and practice something from other web sites.